Liver abscesses typically result from a polymicrobial bacterial infection spreading from the biliary or gastrointestinal tract, either via contiguous spread or seeding from the portal and hepatic veins. The most commonly isolated organisms are E. Coli, K. pneumoniae, and S. constellatus, although fungal causes may also be present in immunocompromised patients. Patients typically present with fever, rigors, and abdominal pain*. Other symptoms include bloating, nausea, anorexia, weight loss, fatigue and jaundice. On examination, patients will have RUQ tenderness +/- hepatomegaly. If the abscess ruptures (a rare complication), then patients may present with signs of shock. FBC will show a leucocytosis and LFTs are often abnormal, with a raised ALP in most cases and deranged ALT and bilirubin in a proportion. All patients should also have peripheral blood and fluid cultures sent for microscopy. Ultrasound imaging will reveal poor-defined lesions with hypo- and hyper-echoic areas, with potential gas bubbles and septations. 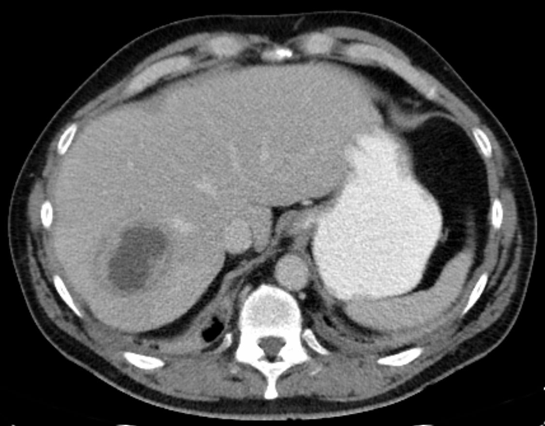 Further delineation can be achieved by CT imaging with contrast (Figure 1), revealing a similar pattern from the collection as seen on US with associated surrounding oedema. Surgery is rarely indicated, predominantly if the abscess has ruptured or refractory to antibiotic treatment. 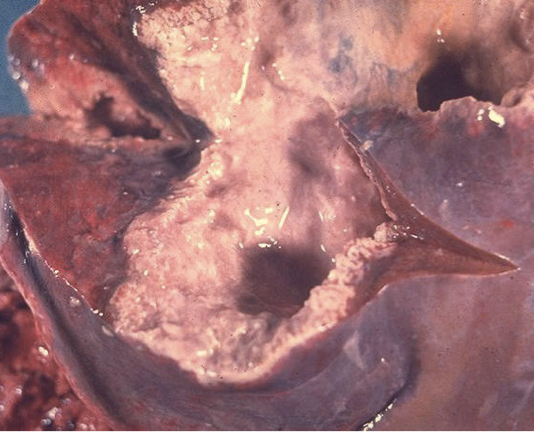 An amoebic abscess is the most common extra-intestinal manifestation of amebiasis infection, caused by the organism Entamoeba histolytica. The infection spreads via faeco-oral route. Once in the colon, the trophozoite begins to invade the mucosa and spread to the liver via the portal system. It is estimated that 12% of the world’s population is infected with this organism, most commonly in developing regions such as South America, the Indian subcontinent, and Africa. Patients will present with vague symptoms of abdominal pain, nausea, fever or rigors, weight loss, and bloating. Cases should be suspected in patients with a history of recent travel (<6 months) to an endemic region. Patients may present with a prodrome of clinical features secondary to the intestinal involvement, including abdominal pain and diarrhoea. Bloods will show a leucocytosis with deranged LFTs. All patients should also have peripheral blood and fluid cultures sent for microscopy. Blood and stool samples should also be sent to check for the presence of E. histolytica antibodies, if suspected. Ultrasound imaging will reveal poor-defined lesions which can be further characterised by CT imaging. Most patients can be treated with antibiotics alone, typically metronidazole or tinidazole are the antimicrobials of choice. In large cysts or those which do not respond well to antibiotic therapy, surgical drainage may be required. A luminal agent such as paromomycin can also be prescribed to eradicate amoebiasis in the colon. Which of the following is not a common causative organism for liver abscesses? What is the optimal management of a non-amoebic liver abscess? Which antimicrobial agent would be a good choice in treating an amoebic liver abscess?